Trantec EM-77 omni-directional, back-electret, condenser models, fitted with connectors to suit Trantec radiomic belt packs, these microphones may also be used, with appropriate adapters, in wired or wireless applications. This lightweight range gives the user extended freedom of movement and is suitable for theatre, conference, and educational applications, for spoken word or song. Trantec part numbers are usually prefixed to indicate which connector is fitted as standard. 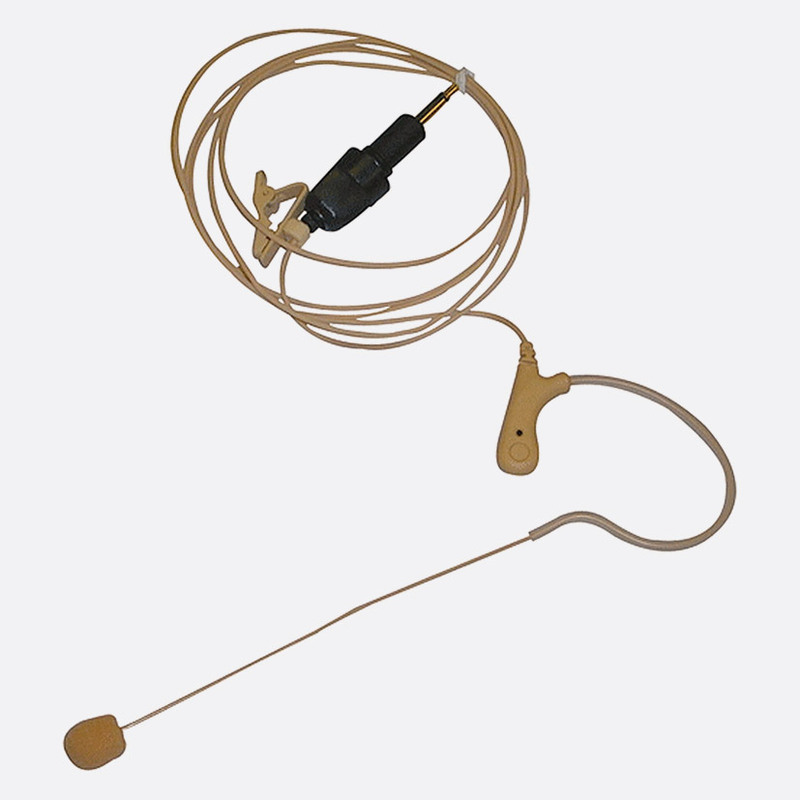 Trantec radiomic belt packs use a variety of connectors, so care should be taken to choose a microphone fitted with the connector to suit the equipment with which it is to be used. SJ prefix: Trantec screw-jack. 3.5mm, 3-pole. X prefix: Miniature 4-pole XLR style. Affordable and discreet, these over-the-ear microphones have been designed to suit the requirements of applications including theatre and education and are particularly suitable for spoken or sung voice applications. Omni-directional, back-electret condenser. Response: 20Hz -20KHz. Impedance: 3000 ohms. Supply: 1.5V to 10V DC. Cable length: 1200mm. Sensitivity: 5mV/Pa +/- 3dB. Colour: Beige.